Grandparents are a blessing in our lives and they are always there for you, through the good and the bad. 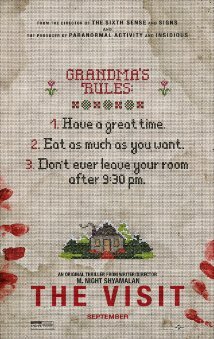 In The Visit, two grandkids are about to see their Nana (Deanna Dunagan) and Pop Pop (Peter McRobbie) for their first time. The reason for it being the first time is that mother (Kathryn Hahn) and her parents got in a fight resulting in years of not speaking to each other, but when the grandparents reach out to see their grandchildren, the mother relents. The daughter, Becca (Olivia Dejonge), films the whole trip including the before, during, and after. Her younger brother Tyler (Ed Oxenbould) doesn't really cooperate and ends up filming with another camera as well. The Visit starts out with some comedy and family moments but when the kids are out on the farm with the grandparents, they slowly notice something is not right. Nana and Pop Pop are really weird, not only during the day but at night as well. Of course all things weird and scary happen when it gets dark and The Visit has moments that make you jump out of your seat too and make you glad you have normal grandparents. If any of you know the works of the director M. Night Shyamalan then be prepared for a twist at the end of the film where all is revealed in the climax.